The R&D concerns the deposition of thick protective boron carbide (B4C) and tungsten coatings on the steel or copper alloy plasma-facing components of a tokamak reactor. B4C coatings up to a thickness of 2 mm, with the use of an interlayer of nickel and B4C or copper and B4C. 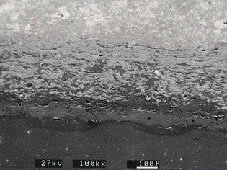 Tungsten coatings up to a thickness of 5 mm deposited on copper-chromium-zirconium alloys, by using a bonding layer of nickel and aluminium. B.Riccardi A.Pizzuto . 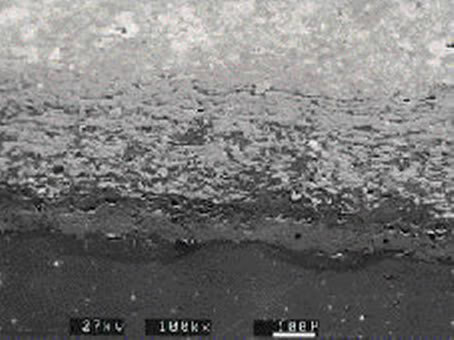 Thermomechanical characterisation of B4C VPS coatings on stainless steel tubular substrates substrates.Journal of Material Science Letters 15(1996), 1234. B.Riccardi,A.Pizzuto, L.Bertamini, R.Montanari : Tungsten thick coatings for plasma facing components. R.Beaumont, P.Libeure, B.de Gentile, G.Tonon (Eds) Fusion Technology 1998- 20th SOFT Marseille.